ABOUT CANADIAN BRASS With an international reputation as one of the most popular brass ensembles today, Canadian Brass has truly earned the distinction of “the world’s most famous brass group.” Masters of concert presentations, Canadian Brass has developed a uniquely engaging stage presence and rapport with audiences. Each of their concerts will show the full range from trademark Baroque and Dixieland tunes to new compositions and arrangements created especially for them—from formal classical presentation to music served up with lively dialogue and theatrical effects. Whatever the style, the music is central and performed with utmost dedication, skill and excellence. The varied Canadian Brass repertoire features brass standards as well as a wide-ranging library of more than 600 original arrangements. With a discography of more than 130 albums, including several videos, and an extensive world-wide touring schedule, Canadian Brass continues to score Billboard chart positions. They are an important pioneer in bringing brass music to mass audiences everywhere throughout the U.S., Canada, Japan and Europe. They have toured South America, the Soviet Union, the Middle East and Australia. They were the first brass ensemble from the West to perform in the People’s Republic of China as well as the first brass group to take the main stage at the venerable Carnegie Hall. Exclusive artists for Conn-Selmer Musical Instruments, the five play on state-of-the-art 24K gold-plated Artisan Bach and Conn horns, hand crafted in the U.S. Canadian Brass records for Opening Day Entertainment Group [Odeg]; their sheet music (published with Hal Leonard Corporation) and recordings are available in their online store canadianbrassstore.com. With four decades under their belts, Canadian Brass continues to thrill audiences around the world—and they don’t look like they are letting up anytime soon! Canadian Brass is Chuck Daellenbach (tuba), Caleb Hudson and Christopher Coletti (trumpets), Achilles Liarmakopoulos (trombone) and Bernhard Scully (horn); represented by IMG Artists in New York www.imgartists.com. 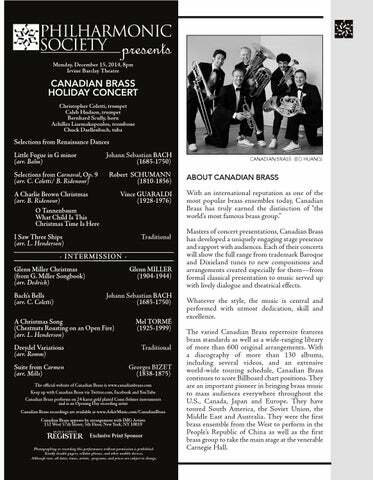 Visit their website at canadianbrass.com. CHRISTOpHeR COleTTI Trumpeter/arranger Christopher Coletti joined the Canadian Brass in 2009. Chris received his Master’s Degree from The Juilliard School and his Bachelor’s Degree which he completed in just 3 years from the Manhattan School of Music. Since joining the group, he has performed hundreds of concerts, TV and radio appearances around the world, recorded four billboard chart-topping/award-winning CDs, filmed multiple music videos, and arranged a plethora of music that the Brass has recorded and regularly performs. Chris got his professional start as principal trumpet of the Huntsville Symphony in Alabama. Comfortable in many musical styles, he has performed with a wide range of musicians, from Yefim Bronfman, Pierre Boulez, Michael Tilson Thomas and Riccardo Muti to Quincy Jones, Carlos Santana and Gloria Estefan and Miami Sound Machine. Throughout his education, Chris received multiple awards and scholarships, and won a number of competitions including the Music Academy of the West Chamber Concerto Competition, Manhattan School of Music Concerto Competition, LaGuardia Arts Concerto Competition Staten Island Symphony Concerto Competition, The Tanglewood Music Center Charles E. Culpeper Foundation Fellowship and Susan B.
Kaplan Fellowship, The Juilliard School Frieda and Harry Aronson Scholarship, and the Manhattan School of Music President Scholarship. Among his numerous accolades, Chris also has perfect pitch, is a proficient whistler, and has the unique ability to sing an operatic high C. Canadian Brass’ dedication to music education is a perfect fit for Chris, who enjoys sharing his unique perspective as a full-time performer, active educator, and recent college graduate with students and fellow teachers. Chris performs exclusively on Bach Artisan Trumpets (Bb, C, Eb and Piccolo), the Bach 184ML Cornet and the Conn Vintage One 1FR Flugelhorn. He is a recording artist for the Toronto-based independent label, Opening Day Entertainment Group. CAleB HUDSON Caleb Hudson joined the Canadian Brass having graduated from the Juilliard School in 2012 with a Bachelor and Master of Music degree. Acclaimed by the New York Times as “brilliantly stylish,” Caleb made his solo debut with the Chamber Music Society of Lincoln Center performing Bach’s Brandenburg Concerto No. 2. Caleb was soloist with pianist Vladimir Feltsman at the Aspen Music Festival in a performance of Shostakovich’s Concerto No. 1 for Piano, Trumpet and Orchestra. 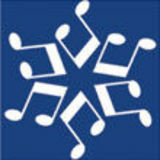 He has performed as a soloist across the U.S., most recently as a recitalist at the University of Georgia Performing Arts Center, where he was also soloist with the UGA Wind Ensemble. Upcoming solo engagements include the Santa Fe Chamber Music Festival and a performance at the Tel Aviv Museum of Art with members of the Israel Philharmonic. Caleb has won first place at the National Trumpet Competition multiple times, and has performed with the New York City Ballet, New World Symphony, Symphony in C, Jupiter Symphony Chamber Players, New York Trumpet Ensemble, and the American Brass Quintet. An avid baroque musician, Caleb also performs with notable early music ensembles including Philharmonia Baroque, American Bach Soloists, The American Classical Orchestra, Concert Royal and the Trinity Baroque Orchestra. He is an alumnus of Ensemble ACJW, a fellowship program of Carnegie Hall that promotes arts advocacy, community outreach, and music education. Native to Lexington, Kentucky, Caleb currently resides in Brooklyn, New York, with his wife, Amanda. He has recorded the “G. Schirmer Horn Library,” which includes much of the standard repertoire for horn and piano. BeRNHARD SCUlly Virtuoso Bernhard Scully is the professor of horn at the University of Illinois, Champagne-Urbana. He is a passionate teacher, and has been on the faculty of the Music Academy of the West, the Eastman School of Music, the Kendall Betts Horn Camp, the Madeline Island Music Camp with the Prairie Winds Quintet, and the Raphael Mendez Brass Institute. Bernhard has numerous awards to his credit, including being the first horn player to win the prestigious McKnight Music Fellowship. In 2010 the University of Wisconsin-Madison awarded him the Distinguished Alumni Award for excellence in artistry. Bernhard has held the position of principal horn with the Saint Paul Chamber Orchestra where he was featured as a soloist on many occasions. Prior to the SPCO he was the horn player of the Canadian Brass, performing on numerous recordings and touring the world. He has been fortunate to return and play with the quintet on numerous occasions since his departure. He is in demand as a soloist, chamber musician, orchestral player (including orchestras such as the Chicago Symphony), and is a frequent guest artist at workshops, conventions, and clinics across the U.S. He currently resides in Champaign, Illinois, with his wife Sarah and their three daughters. ACHIlleS lIARmAkOpOUlOS Award-winning Achilles Liarmakopoulos is the trombonist of the Canadian Brass. Achilles holds degrees from the Yale University School of Music, Curtis Institute of Music, San Francisco Conservatory and the Philippos Nakas Conservatory in his hometown of Athens, Greece. Achilles has toured extensively throughout North America, Europe and Asia, performing and educating in the world’s most important venues and institutions. the University of Toronto. His academic plans were soon derailed when he met trombonist Gene Watts. Together they formed this unique brass quintet with Chuck on tuba. For the next 38 years, Gene and Chuck guided Canadian Brass to the top of their field, through thousands of performances and fantastic opportunities, including two “command” performances for the Queen of England. Chuck’s dialogue during concerts has kept audiences engaged, helping to establish an appreciation for great music of all types to musicians and nonmusicians alike. Possibly the most recognized tuba player in the world, Chuck has performed with many of the greatest musicians and conductors. The definition of a multi-tasker, Chuck always has several projects in the works at once. These include a series of hundreds of brass works published by Hal Leonard (many accompanied by CDs) played by music students and professional players around the world. He runs Canadian Brass Publishing and together with his wife, MB, they manage Opening Day Entertainment Group, the ensemble's recording label. They reside in Toronto, Ontario, with their sons Chris and Will. Upon completion of his studies, he won the position of principal trombone of the Greek Radio Symphony Orchestra. Achilles has also performed with the Malaysian Philharmonic, Jacksonville Symphony and European Union Youth Orchestra, among many others. As a recitalist, Achilles has performed in China, Spain, France, the Netherlands, Austria, Finland, Greece and the U.S., having been awarded honors at competitions around the globe.